Celebrities' reaction after Sachin's last test match. It all started and ended at the same place for Sachin Tendulkar. He began his first class career at Wankhede and played his last test there today. It was an emotional moment, not just for the man who has been carrying Indian cricket on his shoulders for 24 years, but also for his millions and millions of fans around the globe. The Wankhade stadium remained houseful for the presentation ceremony, to witness the farewell Sachin Tendulkar. The social media was filled with wishes and moving good bye messages for the legend. Here are some of the tweets from our celebrities. Rahul Bose- “Thoughts from Wankhede today. Watched cricket here before Sachin, will watch cricket here after Sachin. But it will never be the same again. It seems I was seen crying on tv. Yes. i cried for every moment @sachin_rt illumined our lives tht future generations will never experience”. We, at Behindwoods join the world in saluting the greatest cricketing legend the world has ever seen. 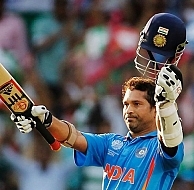 Thank you Sachin for the memories, inspiration and entertainment. Cricket for sure wouldn’t be the same! Will Hrithik Do A Tamil Film? People looking for online information on Amithabh Bachchan, Hrithik Roshan, Sachin tendulkar, Shruti Haasan, Venkat Prabhu will find this news story useful.